This variation of the radish is a long, white root vegetable in the cabbage family (brassicaceae). This mild-flavored winter radish is native to East Asia and is a very popular vegetable in that region. Daikon radishes are commonly pickled in traditional Asian dishes, but one of my favorite uses for this vegetable is to replace white potatoes in AIP-friendly dishes, like Paleo French Fries, AIP Notato Salad, and Scalloped No-Tatoes. 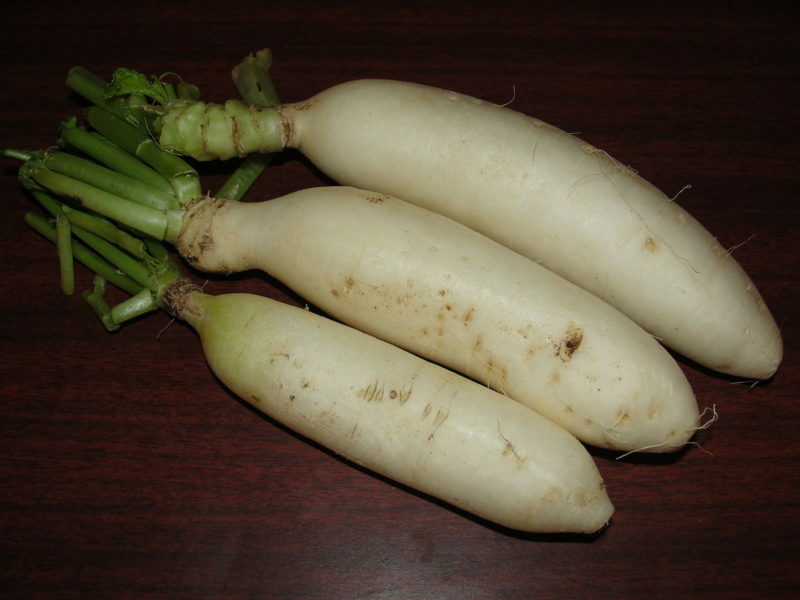 Nutritionally, the daikon radish is the “standard” profile for a root vegetable: it is almost entirely carbohydrates (including fiber) and water, with almost no protein and fat. But, it has very low carbohydrate content, making this plant about 95% water! Additionally, daikon radishes are a good source of vitamin C, with smaller or trace amounts of many other vitamins and minerals. Daikon radishes, like other members of the cabbage family, are cool weather crops, so they’re more likely to be in season during the fall. You can pick them up at your local farmers’ market if you live in a temperate climate, or you might be able to catch them at the grocery store during the fall and winter!